Every day I wake up and go online thinking Manny Machado or Bryce Harper signed overnight and I missed it. And throughout the day, I’m constantly refreshing apps, websites and browsers in anticipation of their signings. So far nothing. Just a lot of wasted time. We are long past the point of ridiculous that two 26-year-old, free-agent generational talents are still unsigned. It’s January 28. Pitchers and catchers officially report in a little over two weeks and there are already many pitchers and position players at their team’s spring training homes working out. Regular-season baseball is closer than Thanksgiving is away, yet neither of the two superstars in this year’s free-agent class have teams to play for. I spent the last few years waiting for this free-agent class like many Yankees fans, thinking 2019 would be the first chance in seven years the team would legitimately contend for a title. When the 2016 trade deadline ended, no one envisioned the Yankees getting within a win of the World Series in 2017 or winning 100 games in 2018, but these Yankees arrived two seasons early, giving Yankees fans two unexpected years of contention and seemingly two extra years of this current window of opportunity. With so many young stars and proven major league talent on cheap contracts, everyone thought the goal of getting under the luxury-tax threshold in 2018 was so the team could blow past it for 2019. The Yankees started this offseason by bringing Brett Gardner and CC Sabathia back. Then they let Patrick Corbin, the best pitcher on the free-agent market, sign with the Nationals, and the fear that the luxury tax would be an issue again began to elevate. They immediately signed J.A. Happ for the rotation spot Corbin was no longer going to fill and then they let David Robertson leave for the second time in four years. The next day they signed Troy Tulowitzki, who missed all of 2018, to potentially play shortstop in Didi Gregorius’ absence, and then two days later, they signed Zach Britton. The following week, out of nowhere, they signed DJ LeMahieu, and later that week, they signed Adam Ottavino to make up for the loss of Robertson. The Ottavino contract put the Yankees over the luxury-tax threshold, and even after the trade of Sonny Gray, they remain above it. All the while, Machado and Harper remain free agents. Despite being the best two players on the free-agent market and despite the Yankees breaking the threshold, two of the absolute best players in the world remain unsigned. 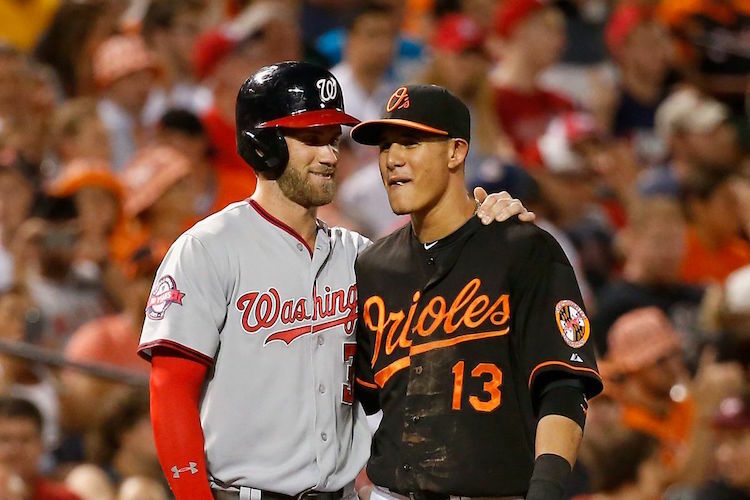 Machado and Harper are still free agents because their numbers haven’t been met. And if there is any truth to the seven-year, $175 million offer from the White Sox to Machado, their numbers aren’t being close to met. (Reminder: Harper turned down $300 million from the Nationals.) Prior to the offseason, signing either to a $300 million deal seemed like a bargain and now it seems like neither will touch that number, which will only make it that more painful if the Yankees sign neither, and don’t forget, I want them to sign both. THEY ARE BOTH YOUNGER THAN AARON JUDGE! Bringing Gardner, Sabathia, Happ and Britton back and adding LeMahieu, Ottavino and (I guess) Tulowitzki makes the Yankees contenders yet again. Add in a full season of a healthy Judge, Gary Sanchez and Gleyber Torres and a year of adjusting to the American League and New York for Giancarlo Stanton, and it seems like the Yankees should be even better than their triple-digit win total of a year ago. But I also thought adding Stanton and replacing Starlin Castro and Chase Headley with Torres and Miguel Andujar would be the difference of losing Games 6 and 7 of the ALCS and reaching the World Series and it wasn’t. You can’t predict injuries and you can’t expect success to carry over from one year to the next. The Yankees weren’t good enough to end their championship drought in 2017 or 2018, and I’m not sure, even with the cleanest bill of health and all of the offseason signings that they will be any better this coming years. The Yankees can win the World Series with Machado and Harper, and that’s what Yankees ownership is banking on as this October will mark a decade since the team last reached the World Series. But that doesn’t mean the Yankees shouldn’t put the best possible team on the field. The best possible team doesn’t guarantee that you will win, but it gives you the best possible chance to win. The biggest fear this offseason from Yankees fans was that the luxury-tax threshold would prevent the team from doing everything possible to create the best possible team. For a while, it looked like the luxury tax might ruin the 2019 season the way it did the 2018 season (Shane Robinson! ), but now that the Yankees are over the luxury tax, they might as well do what everyone expected them to do three years ago and clean up with this free-agent class. The book details my life as a Yankees fan, growing up watching Derek Jeter, Mariano Rivera, Andy Pettitte, Jorge Posada and Bernie Williams through my childhood and early adulthood and the shift to now watching Gary Sanchez, Luis Severino, Aaron Judge and others become the latest generation of Yankees baseball. It’s a journey through the 2017 postseason with flashbacks to games and moments from the Brian Cashman era. Click here to purchase the book through Amazon as an ebook. You can read it on any Apple device by downloading the free Kindle app.